Today, I am pretty excited about the fact that I was invited to a cookie exchange. I decided to make what my cookie book called: Chocolate Peppermint Refrigerator Cookies, but I am calling them Peppermint Pinwheel Cookies. The reasons are two fold: 1) I simply like the name better, 2) I should have pinwheeled them; it would have been a lot easier. Having never been to a cookie exchange before, let alone a Christmas cookie exchange, I didn't know any of the basic rules... such as "regular cookies" aren't part of the foray. I figured we would have chocolate chip cookies, snickerdoodles, gingersnaps, chocolate crinkles and I was very concerned with not submitting a rerun cookie. In actuality though, the spread was almost unilaterally composed of variations of the sugar cookie. Mine, of the peppermint persuasion, spritz, by definition sugar cookies, brown sugar cookies, store bought sugar cookies, gingerbread cookies, praline cookies, orange cookies and so on that you get the point. Which honestly, I should have been able to deduce prior to the event. If there is one thing that defines me as a baker it is this: I can't will myself (no matter how hard I try) to stick to a recipe without deviation. Oh wait there's another thing too: I can't will myself (no matter how teeming my calender is) to make my showcase earlier than the day of. I didn't have peppermint candies to crush, and I didn't have peppermint extract. 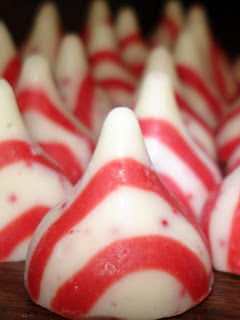 I did however have white chocolate peppermint Hersey's kisses though, and I figured they would do the trick - the morning of. They are delicious by the way! All in all they turned out sufficient. I would make a few changes, should I ever make this recipe again, and I have made those adjustments in the recipe below. I will say however, this recipe has inspired me for how to make my birthday cake in 15 days (which is all that matters, and all I've been thinking about for the past 2 months)!! Add to butter sugar mixture until combined. Seperate dough in half. Roll chocolate dough flat 1/4 inch thick on wax paper. 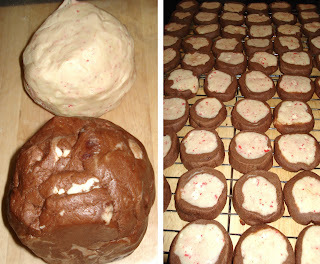 Press peppermint dough on top of chocolate dough until they are parallel and no chocolate dough is visible. Using wax paper roll doughs together until they form a long log. Transfer to a fresh sheet of wax paper and roll until the shape is smooth and circular. Wrap with wax paper and aluminum foil and refrigerate until firm. Cut slices to desired width, and bake in preheated oven at 350° for 6 -7 minutes for soft and chewy, 8-10 for crispy but melt in your mouth. wow these look really good! now those look amazingly wonderful! you are darling!